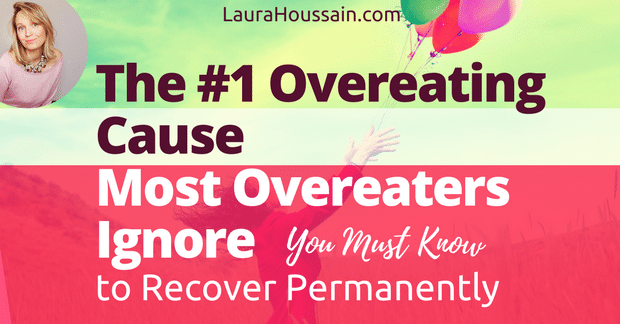 So You Think You Know What Causes Overeating? Guess Again! What you’re about to discover is the least talked about reason why people binge and overeat mindlessly. It may feel good to blame compulsive eating on the food industry or your body deficiencies. But these are minor factors. I’ve seen the charts “if you crave this, then you lack that.” But supplementing won’t break your food addiction. So, if you feel like you’ve tried everything and worry that even if you do good for a while, one day you’ll just end up eating out of exhaustion, then read on. In a couple of minutes, you will know exactly why you find it so hard to stop overeating consistently and what you can do about it! Warning! What you’re about to read may be slightly disturbing, but massively liberating. So let me get those out of the way. You’re not broken, I am 100% positive that you have all the self-discipline you need to stop overeating because you don’t need that much, you have more control over your genes than you imagine, and motivation is not a real factor here. Whoever may have convinced you that you were the problem is WRONG. The problem is the relationship you have created with food and eating, and why! How and Why Do We Get Addicted to Food? You may not remember it, and maybe it didn’t last very long, but at first, it was exciting to overeat because it served a purpose. It alleviated a feeling of powerlessness. It can be a perception or a belief like I’m not enough, I’m not loveable, or people will always reject me. They both can trigger strong negative emotions. You feel bad, bored, lonely, empty, or under too much pressure — then food comes along, and it gives you a feeling that you can control those emotions. This may not happen at a conscious level, but your brain takes notice. So at some point food seemed good for you. For example: When I lived in NY as an MBA exchange student, I felt completely homesick. I would eat the same brand of cookies and sweets with my French roommate every night. I didn’t know why I was doing it at the time. But it’s clear now that I was trying to get a taste of home. I know this because the cookies and sweets I was eating were the same ones I could find in France, my home country. Same brand, same taste, same everything. One of my clients was convinced that she was so unlovable she had let a good man slip away and feared no one would ever love her again. She was adorable, but she believed she couldn’t be loved. Consequently, she was using food as a love substitute. You may not be aware of this. But you probably went through a similar unconscious process. At some point, you asked food or eating to give you a sense of power or control. It probably happened without you paying attention. But soon enough, you had a bigger problem on top of the one you were trying to escape or alleviate. While I was in NYC, I gained weight, had pimples on my face, ruined my health, and stopped pursuing my dreams. I felt ashamed because I was failing myself… and I was still homesick. So, my nightly cookie and sweet ritual were not helping at all. 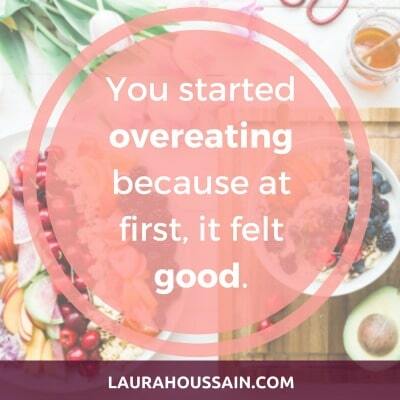 “No,” you may be thinking, “I don’t have these kinds of issues.” And I know a few high achievers who tell me that they are very happy with their lives, except with this single eating problem… but compulsive eating serves them as well. For example, it alleviates the pressure that comes with high achievement or the pain of a setback. One good example is Oprah who confessed binging on carbs during several occasions. For example, 30lbs of macaroni and cheese after her movie Beloved flopped in 1998. So if you feel food is your friend and your enemy, it means you have created a toxic relationship with food. Food or eating makes you feel good, and that’s why you call it your friend. But now, you have disempowered yourself even more: you have started the habit of changing your mood with food instead of taking care of yourself. In other words, you have become addicted to food. So food is your enemy because it’s keeping you from confronting your fear, providing yourself the very thing you need, and growing into your true self. It creates a gap, a disconnection between the addicted you and the real you. You can sit at a table and eat mindfully all you want. If you don’t understand why you created a toxic relationship with food and change it, then you’re at risk to resorting to food sooner or later. I stopped compulsive overeating of sugary foods opsifùoqùosjklnvdsklnvln,n I returned to France. But after years of being stuck in an unhealthy relationship with a man, I denied my pain and started resorting to sugar and gained weight again. So if you want to find peace with food, you’ll have to change the way you treat yourself. Yes, it’s a good idea to learn mindful eating, intuitive eating, and understanding fullness cues. But, if you don’t address the core issue, you are at risk for a relapse or hop from one toxic relationship to another. Some smokers become addicted to food when they stop smoking, alcoholics turn to coffee and sugar. Nothing has changed. They have just transferred their addiction to a new substance or behavior. 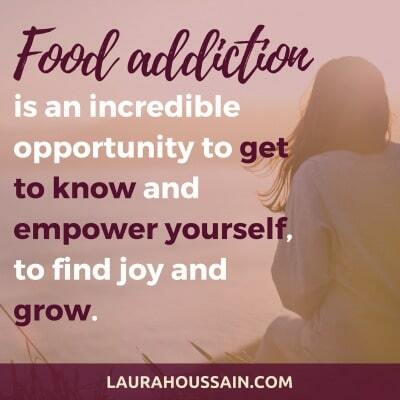 It may surprise you, but I have found that addiction is an incredible opportunity to get to know yourself and empower yourself, to find joy and grow. But it takes courage and the willingness to connect with your emotions, transcend your deepest fears, let go of negative beliefs, learn a few simple skills, and a practice self-care. Now you may be thinking, “This seems so hard and time-consuming. I could never do that.” But you’ll find it’s fun, exciting, and liberating, and can easily fit your busy schedule. If you lack motivation, read my post on How to Stop Screwing Yourself Over With Food and download your free fail-proof, time-tested self-care practice motivation cheat sheets. And, soon you’ll find that food is not your mind so much. Enjoy! And, if you have liked this article or share some feedback, do so now in the comments below.